Powers/Abilities: Magnetic abilities allowing him to manipulate metal over a distance. He can use this to "fly" short distances by hooking onto something metal and then pulling himself towards it. 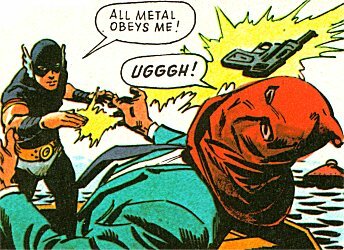 History: (Magno, Man of Magnetism, Pow Annual 1971.) Sandy Laker had graduated at a Northern University, and was returning home to London. He noticed that his old neighbourhood around his father's cafe in the East End Portland Dock area had got rougher, with even the police patrolling in pairs. Arriving at his Dad's place, he discovered the place being smashed up by two masked thugs. Using Judo, he made short work of them, but his father told him off, saying that they would only be back later looking for revenge - they are part of a dangerous gang known as the Maskmen. Ignoring his father, Sandy goes to inform the police, but the Maskmen are watching, and pursue him. The chase takes them out of town, where Sandy's car is bathed in a strange light from some sort of UFO, causing him to crash. The Maskmen drive off thinking him dead. The saucer continues to bathe Sandy in its strange light, causing Sandy to experience a throbbing sensation that revives him from his unconscious state. He realises that the car is about to blow up, and suddenly, as he thinks of escape, finds himself thrown clear of the vehicle. His body tingling, he discovers that he can now repel metal; he has become a human magnet. Returning to his Dad's cafe, he finds that the Maskmen have set fire to it, and his father is being taken to hospital. The police sergeant present tells Sandy that the brains behind the gang is known only as The Mask, and later, when he is alone, Sandy swears he will make the Mask and his gang pay. 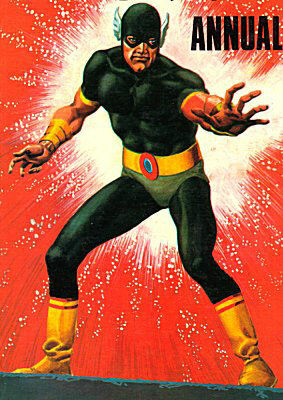 For days he practices with his new powers and makes himself a costume, announcing that he has become Magno, the Man of Magnetism. He hangs around the docks until he eventually spots the car that chased him. This leads him to the gang's hideout, and after they have all left he searches the hideout and finds clues to their next target, a raid on a cargo ship. When the gang begin their robbery he is waiting for them, and makes short work of them. The Mask flees in a speedboat, but Magno catches onto the boat with his powers to carry him over the water to it, swiftly subduing him. Having ended the menace of the Maskmen, Sandy decides that he has found himself a new job in life, battling crime as Magno. Comments: Thanks to Chris Adams, who informed me of the existence of this character and gave me my initial information about him.